The personification of beauty, grace, charm and elegance. 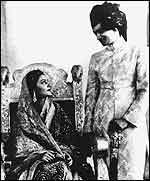 This picture was taken after the wedding of Princess Gayatri Devi of Cooch Behar and Maharaja Sawai Man Singh II of Jaipur. 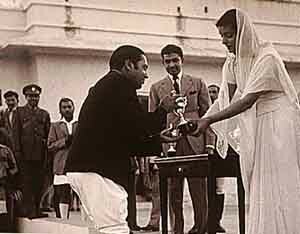 The Maharani Gayatri Devi presenting a polo trophy to His Highness the Maharaja George Jivaji Rao Scindia of Gwalior in the 1940s. 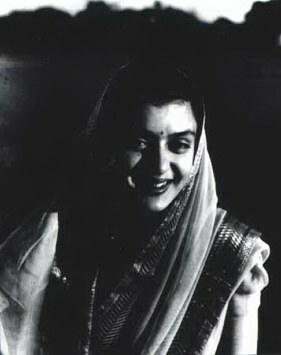 The Maharaja Jivaji Rao Scindia's Maharani was the late Rajmata Vijaya Raje Scindia. 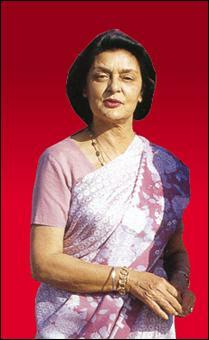 The Rajmata was very active in politics and served as the Member of Parliament with the Bhartiya Janta Party. Their son, the Maharaja Madhav Rao Scindia played an active role in politics, but was part of the Congress Party, the Rajmata's opposition party. The Maharaja Madhav Rao Scindia died suddenly in September 2001 in an aircraft accident. 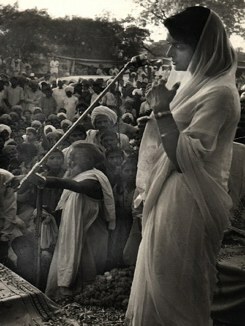 The Maharani campaigning for the Jaipur constituency on behalf of the Swatantra Party. 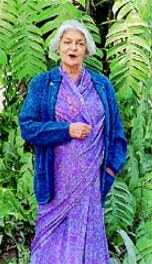 The Rajmata of Jaipur at the Veuve Clicquot sponsored Gold Cup for the British Open Polo Championship at Cowdray Park, West Sussex on 21st July 2002. 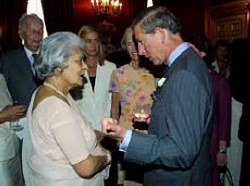 The photograph above is copyright© of Desmond O' Neill to whom all rights are reserved. 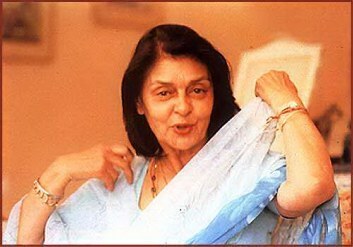 The radiant Maharani Gayatri Devi of Jaipur. 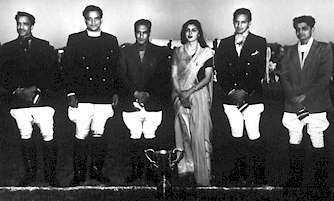 Her Highness Maharani Gayatri Devi and His Highness Maharaja Man Singh with the Jaipur Polo team. 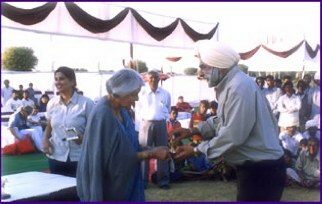 The Maharaja Man Singh II stands second from the left. 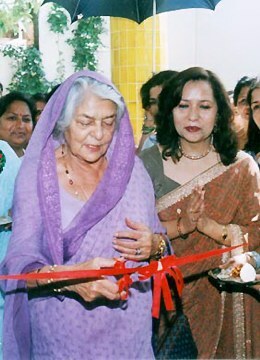 Yuvraj Vikrmaditya and Yuvrani Chitra of Jammu & Kashmir with the Maharani Gayatri Devi of Jaipur. 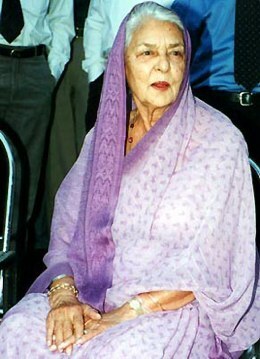 The Yuvrani Chitra is the daughter of Maharaja Madhavrao Scindia and Maharani Madhvi Raje Scindia of Gwalior. 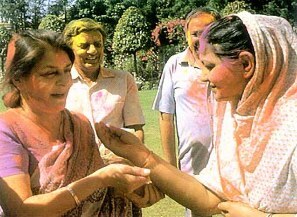 The Rajmata of Jaipur celebrating the Hindu festival of Holi. 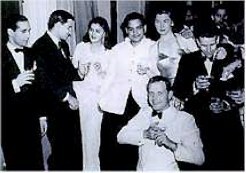 The Rajmata Gayatri Devi Sahiba seated on the right. 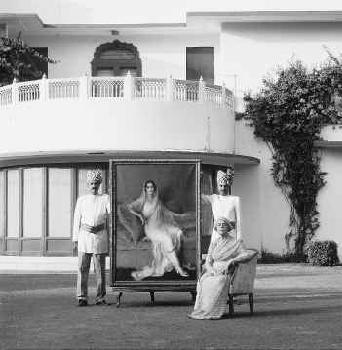 Behind her are two courtiers holding up a magnificent portrait of her mother the most beautiful Maharani Indira Devi of Cooch-Behar. This picture was taken on the lawns of the Lillypool. Lillypool is the Rajmata's home on the grounds of Rambagh Palace, Jaipur. 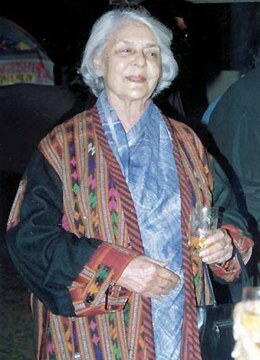 Rajmata Gayatri Devi as the elite guest at the fashion show "Khadi for Fashion" by Raghavendra Rathore held at Hotel Jai Mahal Palace, Jaipur on January 31, 2002. 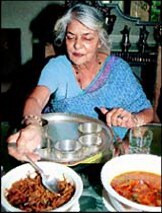 The Rajmata dining at her home the Lilypool. 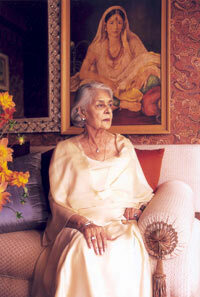 Her Highness The Rajmata Gayatri Devi Sahiba was honored by ARISIA on November 11, 2003 poses in front of her portraits taken in the 1960s. 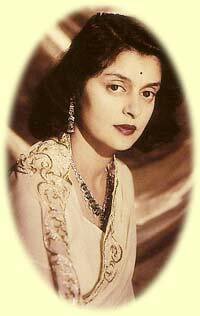 Though many years have passed the Rajmata continues to be the embodiment of grace, charm and elegance. 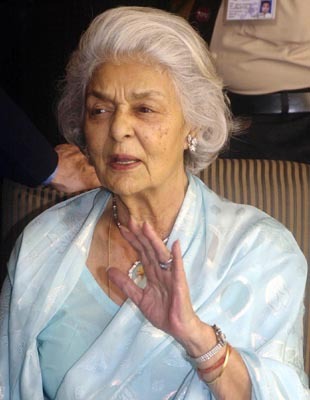 Click here to read the article on the Rajmata's tribute. The Rajmata at her tribute by ARISIA. 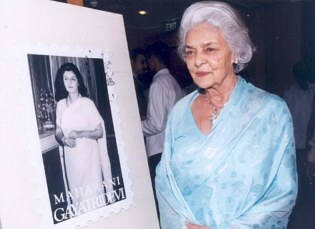 Her Highness Rajmata Gayatri Devi Sahiba. The Rajmata poses for the camera in a gold evening gown.